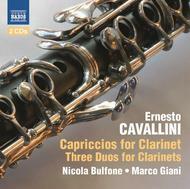 Renowned throughout Europe, Ernesto Cavallini became known as ‘the Paganini of the clarinet’ for his beautiful tone and dazzling performances. The Capriccios are unquestionably his most significant didactic works and are still used as mandatory exam pieces at Italian conservatoires. They push the performer to the technical limits of the time, ranging from Paganini-esque virtuosity to operatic cantabile writing. Recorded here for the first time, the Three Duos were also composed for teaching purposes, placing animated musical conversations and elegant Italian bel canto vocal style into classical sonata form.